The first major confrontation between the newly-arrived armies would take place at Biyed, a jungle planet in the FR1707 system. There, a spearhead force of Chaos Marines would encounter a large raiding force of Orks, led by the renowned Mek warchief Frazzleboom Bloodyspanna. The two forces deployed. Two of the objectives lay in or near the Orkish starting point, and a third lay well within the Chaos Marines’ deployment area. The fourth was located in an area of sparse woods in the centre of the otherwise heavily-jungled terrain. Strange radiation—doubtless due to Goatronium deposits—permeated the battlefield, potentially causing havoc with vehicles. The Orks struck first. Three Deffkoptas of the 1st, 2nd, and 3rd Savagefang Squadrons darted forward, and fired their rokkits towards the approaching enemy. There was a huge explosion, and the sole Chaos Predator battle tank was little more than smoking crater. Moments later, a blast from a Shokk Attack Gun laid waste to the surviving piece of enemy armour, a Rhino filled with Khorne Beserkers. In a few short minutes, Chaos had been shorn of all their heavy support. The dark psychotic reavers were not ones to dismay easily, however—or indeed at all. 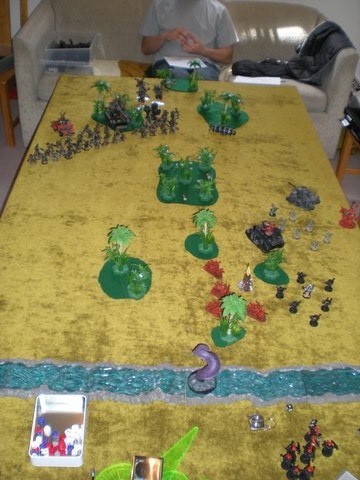 Four Warbikes raced to try outflank the Orks on the left, while the Bezerkers and a platoon of Plague Marines pressed forward to the central objective. 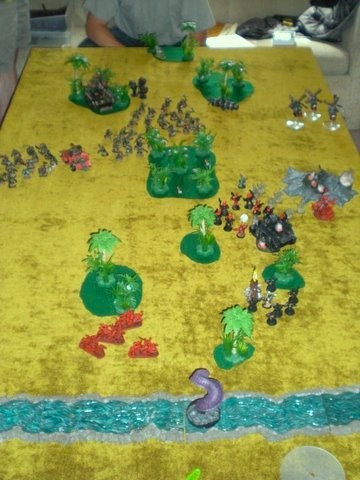 The third and final unit of Chaos Space marines secured the objective in their original deployment area. The Bezerkers and Plague Marines soon came under withering fire from the Deffkotpas, as well as the Shokk Attack Gun, while the Bikers went to ground after being hit repeatedly by a ramshackle but deadly Orkish Boomgun mounted on old, looted Imperial Baslisk. One unit of Shoota Boyz took heavy fire, and briefly fell back before rallying. As the armies closed, a horde of Slugga Boyz charged the remnants of the Plague Marines, wiping them out. Their joy (and unrestrained looting) was shortlived, however, as they were in turn charged by the Bezerkers, and slaughtered to a greenskin. The surviving Bezerkers then advanced into the woods, where another unit of Shoota Boyz were waiting for them. The Shoota Boyz emptied dakka into their foes, then charged. Most of the Chaos troops fell, but a single brave warrior fought, outnumbered, throwing back endless waves of Orks in a bloody demonstration of Chaotic fighting prowess until he was finally crushed—literally—under a mass of irate green attackers. The unfortunate bikers righted their bikes and were preparing to resume their advance when another round from the Boomgun landed among them. When the dust cleared, there were none left. This left only a single unit of Chaos Space Marines. Deciding that it was better to live to corrupt another day, they retreated from the battlefield—closely followed by a barrage of obscene Orkish taunts and gestures, gutteral shouts of jubilation, and squabbles over who got to loot what from the fallen warriors.